To make money Maud sold her paintings from their roadside home to tourists and passersby for about $5.00 each, and never more than the $10.00 apiece she was asking for around the time of her death in 1970. Since the 2017 release of the film Maudie starring Sally Hawkins as Maud and Ethan Hawke as Everett, which dramatically depicts Lewis’ life, there has been a resurgence in the popularity of her work. Thanks to the film a whole new generation of people are coming to know and love this warm, delightful spirit who painted such bright happy scenes of life in rural Nova Scotia. We recently visited the permanent exhibit containing a large number of Lewis’ works at the Art Gallery of Nova Scotia (AGNS) in Halifax. 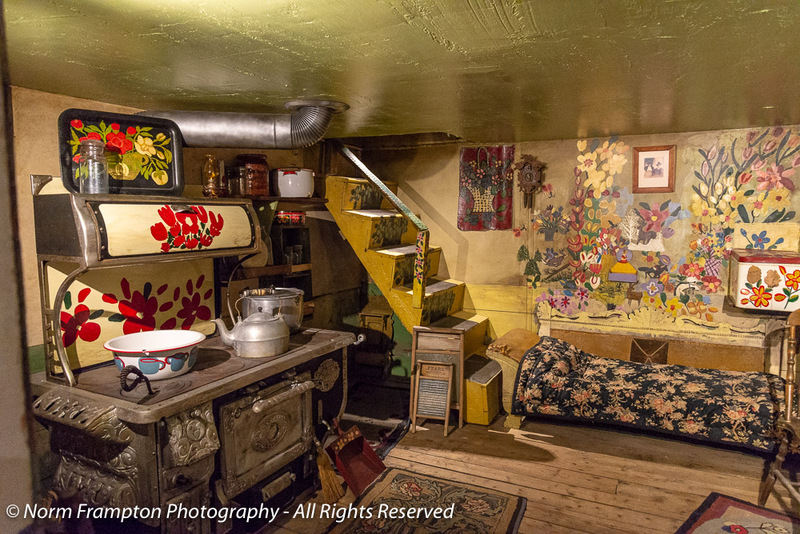 The star of the AGNS-Lewis exhibit is not any one of Maud’s framed works, but perhaps her greatest work of all, the one-room shack she and Everett lived in. 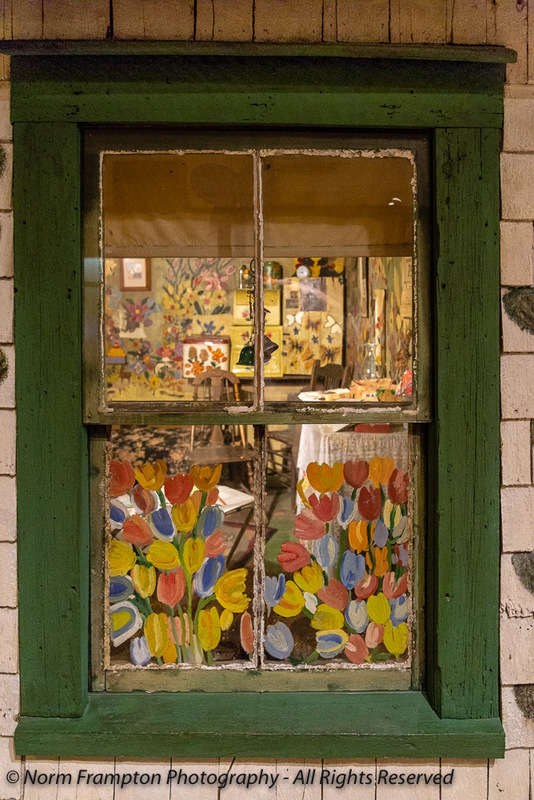 Over the 30+ years she spent in this 13 1/2 foot by 12 1/2 foot (4.1m x 3.8m ) home, Lewis painted virtually every surface with her joyful artwork. People would often drive past and notice the odd sight of this cheerfully painted roadside shack in Marshalltown, with the “Art for Sale” sign out front, and then circle back to take a closer look. 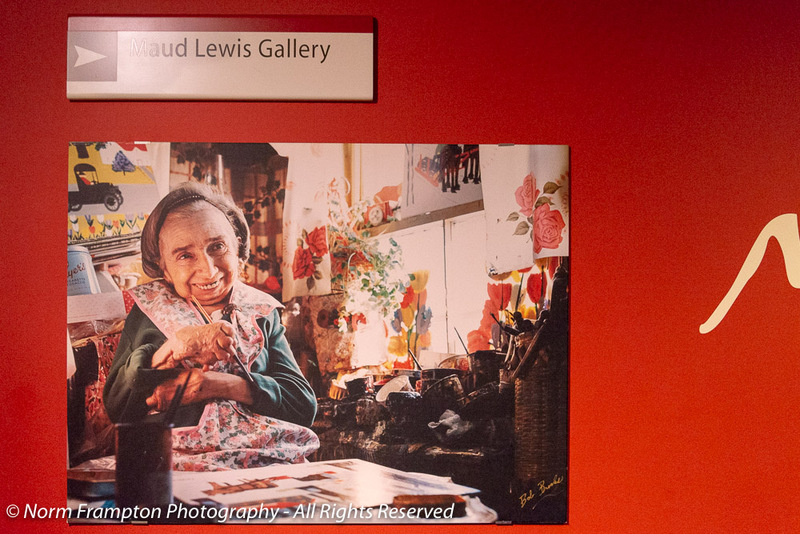 Despite never travelling more than 90 miles (145 km) from her home in her entire life, Lewis’ work grew in popularity thanks in part to a feature article and photo-shoot published in the Toronto Star newspaper which was then followed-up by a profile piece on our national network, CBC television in 1965. After Everett’s death in 1979 the home was abandoned and left to deteriorate. 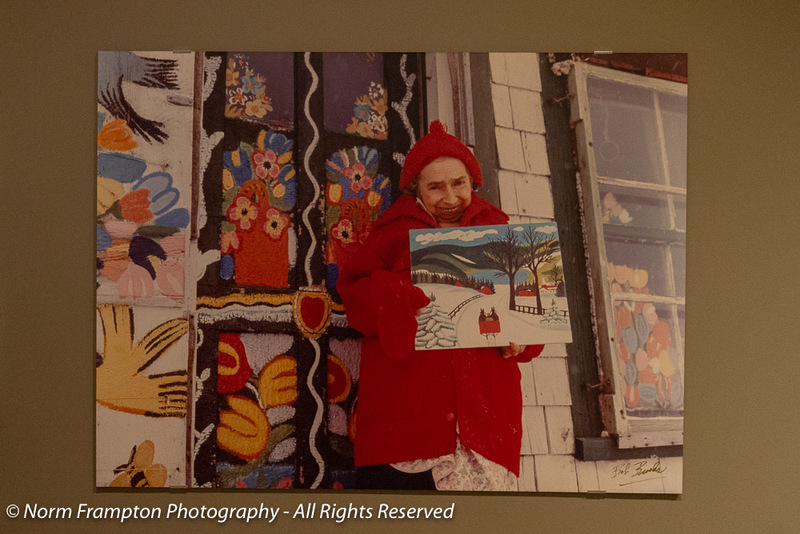 A group of concerned citizens from the area formed the Maud Lewis Painted House Society in an effort to save the landmark structure. 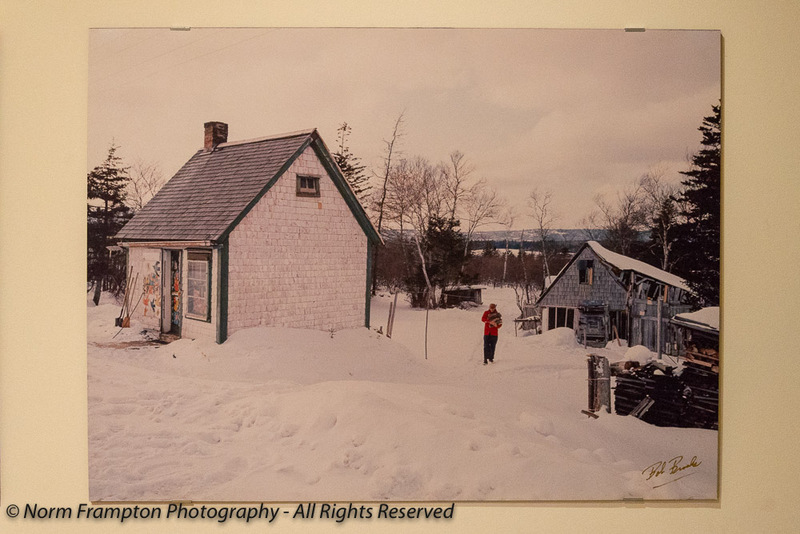 In 1984 the province of Nova Scotia purchased the home from the group in order to preserve it as a heritage building. 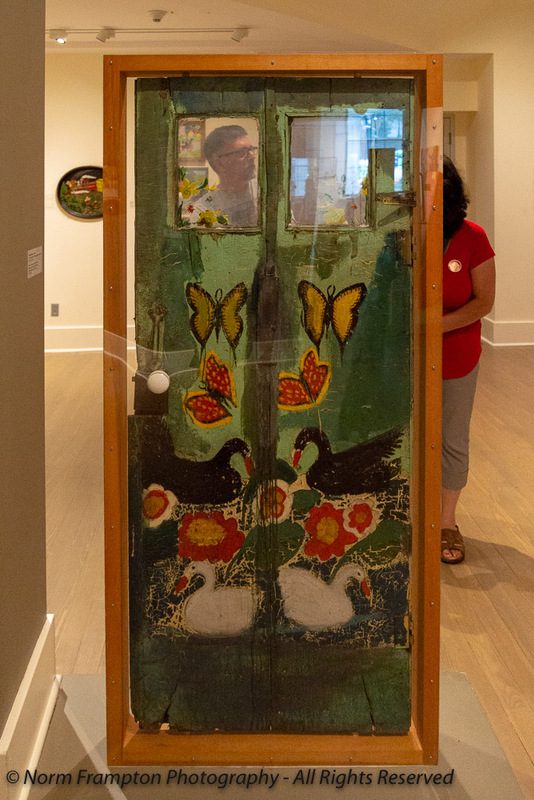 It was eventually dismantled piece by piece and moved to the AGNS where it was painstakingly restored, and then reassembled and put on display as part of the permanent exhibit. 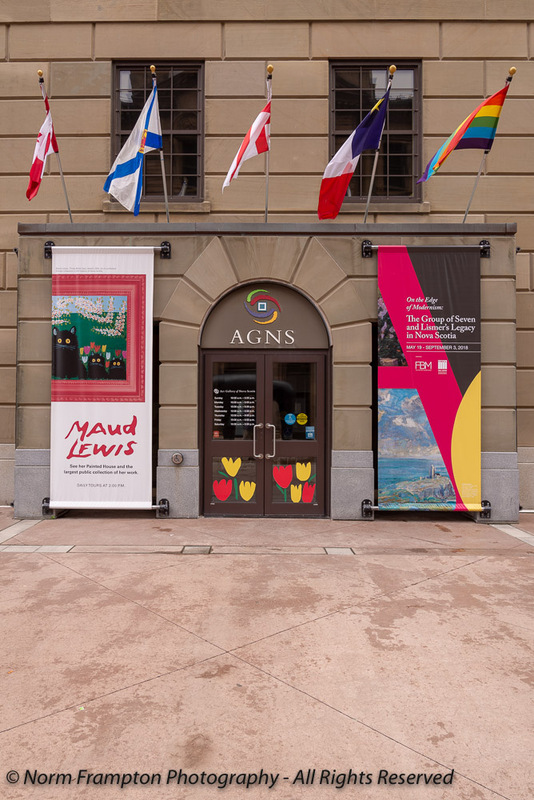 If you’re interested, you can read more about Maud Lewis’ life here or find out more about the AGNS and this exhibit on their website. If you get the chance to, I’d also highly recommend the movie Maudie, particularly for Hawkins’ performance, but a word of warning: make sure to keep the tissues handy. Gallery | This entry was posted in Photography, Thursday Doors and tagged AGNS, Canada, Doors, Folk Art, Halifax, Maud Lewis, Maudie, Nova Scotia, Thursday Doors. Bookmark the permalink. Most interesting story. I’d love to have been standing where you were when you took these marvellous photos. Not only interesting pix, but interesting trivia: South Ohio (USA) is where I live, and now I learn there is a South Ohio in Nova Scotia. Makes me wonder how the town in Nova Scotia came to be named (perhaps founded by someone originally from the southern half of the state?). Welcome and thanks for the visit and comment. Yes, the area seems to have been settled by Europeans in the latter half of the 18th century. I don’t know this for certain mind you, but my guess would be by loyalists fleeing the US after the war of independence. Husband and I watched MAUDIE last weekend after reading your post. It was spectacular! Thanks for recommending the movie Norm. Thanks Denise. I’m glad to hear you both enjoyed it. That is such a wonderful piece of history preserved. I’ve seen the previews for the movie, but haven’t watched it. This definitely piques my interest. Nova Scotia is where my maternal grandfather was born and my mother and I talk about visiting there. Thanks Amy. We found the film to be very moving. .
My mom was born on Cape Breton Island in Nova Scotia. Giving her the chance to go back there this summer for the first time in over 40 years was pretty special. I hope you do decide to visit, you won’t regret it; such beautiful scenery and the people are so friendly and welcoming. Thank you so much Norm for sharing her incredible story and all the photos. I intend to follow it up and am thinking about finding some door photos of my own to participate in your weekly challenge. I was completely unaware of Maud’s story and am absolutely delighted that you have introduced me to it. I was not ready for the entire house to be on display and shouted out WOW when it appeared here in the post. Whimsical. Wonderous. Wowza. Thank you for entertaining me so completely today. Thanks for the visit and the kind words Lisa. As part of the exhibit there’s a display with photos and info panels explaining how they dismantled, moved, restored, and reassembled it all: truly fascinating stuff. Thanks Brenda. The whole story of how they disassembled and moved the house was quite fascinating too. Welcome back Norm! What a delightful post! 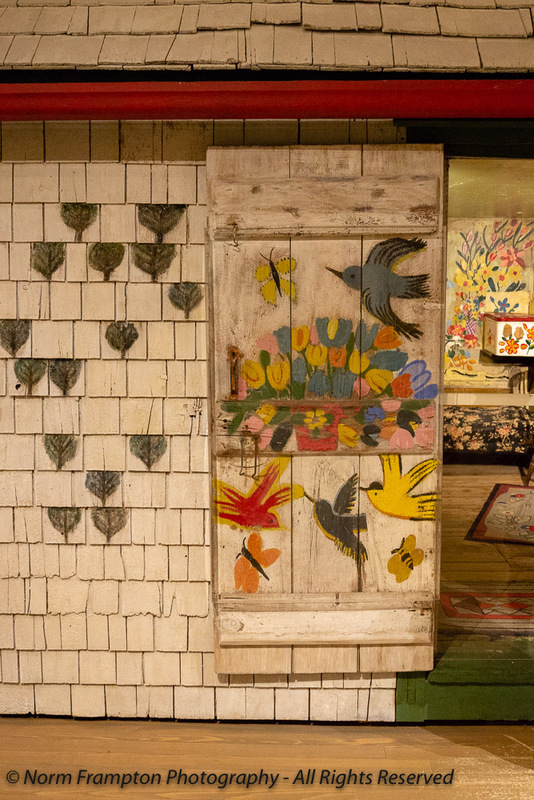 I love her folk art style of painting, and her life story is amazing. I’m going to look for the movie too. I enjoyed her colorful world. AND I find out there’s an Ethan Hawke movie I haven’t seen. Thanks, Norm! That’s so cool they restored her house. She was a terrific artist. I will definitely see the movie. And if you do see the movie, by all means let me know what you think of it. What delightful art! She must have been a very happy soul, to create such a bright environment for herself. We have several Grandma Moses prints, the closest American equivalent to “Maudie”. Thanks Marian. 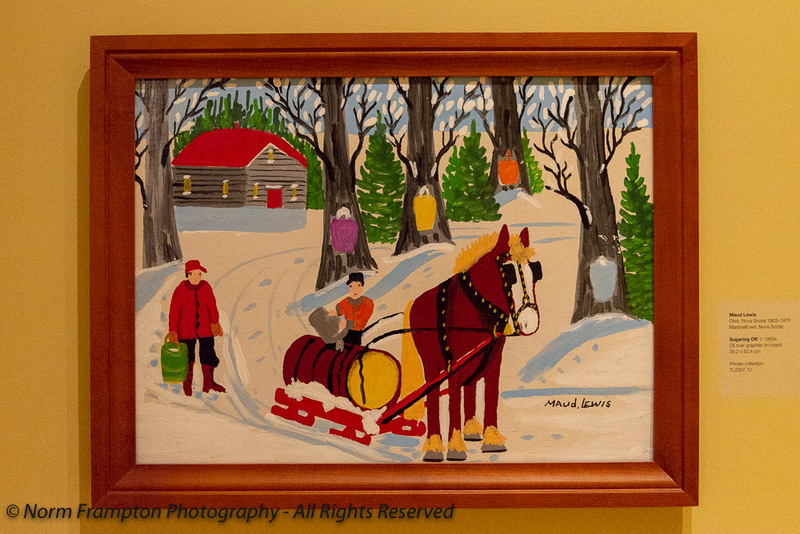 I saw a lot of references to Grandma Moses while researching for this post. Fascinating post Norm. I’m reading about how Europes decimated bird life. Nice to see a ray of sunshine. oh and welcome back ! what an inspiring artist Maude was. 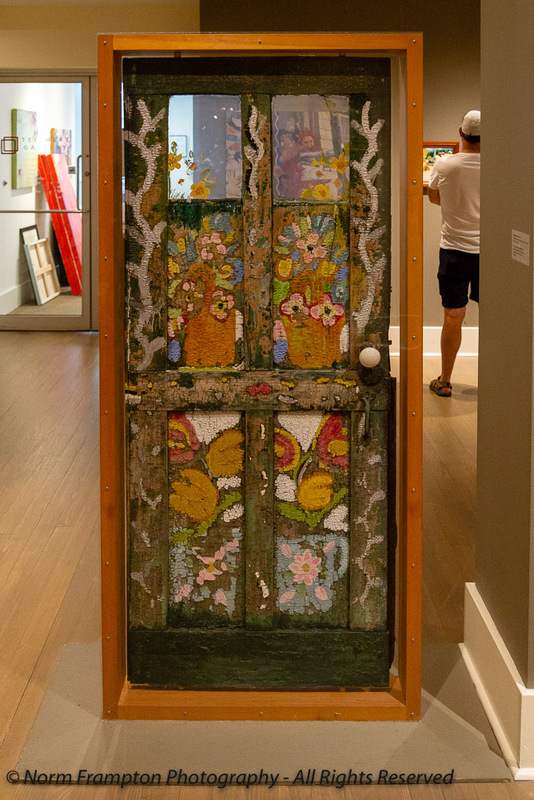 and my fav picture of this post is the one of the door and the man standing looking at the art to the back right. You give us a sense of the setting and scale – but also even more of the vibe as they commemorate this wonderful painter. Welcome back, Norm! Thank you for introducing me to Maude. Her spirit and joy of life shine through all of her work. 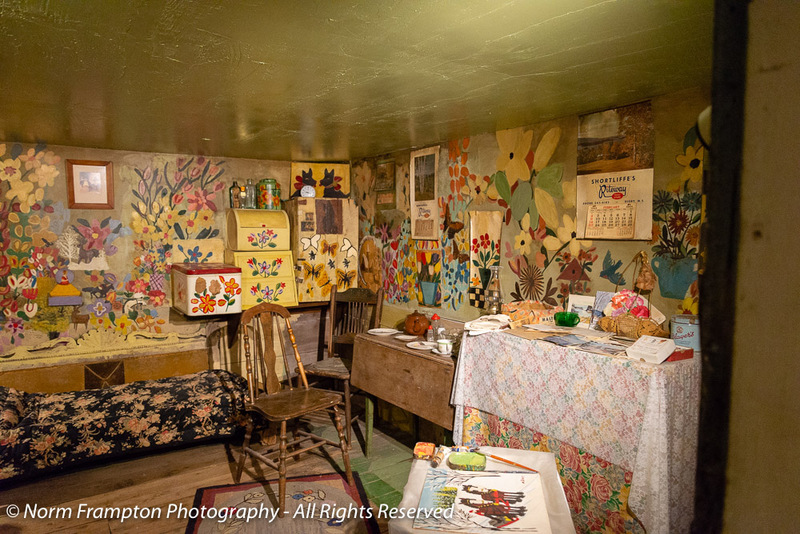 I love that she decorated every square inch of her home… she had no barriers to her creativity. I am going to look for Maudie on Netflix (or wherever). Thanks for the warning about the tissues. What a wonderful post. Maud’s creativity just spills out. Have put this on my list of places to see. Thanks, Norm. I’m going to leave the work of a fellow blogger here — this is a poem about doors, inspired by our group. If you like, you can link him to the frog. Wasn’t this too awesome?! Thanks for bringing it to my attention. Yes I did add it to the link-up list. I also went by to leave a comment on his blog but it seems that I’m in spam filter prison again. I can’t thank you enough for sharing this new-to-me artist and her delightful vision. I love the colors and spirit of her work. It’s resplendent with cheer and appreciation for the natural world. I’m positively delighted someone saw to saving these pieces of hers and very pleased in the resurgence of her work. This was an excellent choice for your return. Thank you! Thank you Joey. I had a feeling you would like this one and from your reaction to this post I’m certain you’ll love the film too. Thank you. I deleted the faulty link but just so you know, if it ever happens again I do allow in the settings for everyone to be able to delete they’re own link if there’s a problem with it. Welcome back in blogland, Norm. Hope you had the things in your vacation you wanted! Wow, love this story -every detail of her life is that one of an passionate artist! How rich or poor one is, does not count in the end. She lived well and to the fullest. You gave a beautiful and clear account of that. I wished I had known her while she was alive! Delightful! I saw the movie a while back – she sure had a hard life but at least found some joy in painting. Thank Jan. I agree. Wasn’t Hawkins just wonderful in the film? It worked fine. By the way, you can always click on your own link after you post to double check it if you’re not sure. And I did allow in the settings for everyone to be able to delete they’re own link if there’s a problem with it. I am awed by how two people can live for thirty years in such close proximity and remain married. Most importantly, I am inspired by her adaptability…I do not know her story (yet, plan to watch movie asap) but she appears to have embraced her talents and put forth nothing but beauty instead of resentment or anger. Welcome back Norm, terrific post! We just finished the movie. It was excellent, had to be with Ethan Hawke. Thank you so much for introducing me to Maudie and her artwork. What a lovely post – I shall be sure to look out for the film. Welcome back. Hawkins’ performance in the film just floored me. If you do end up seeing it please circle back and let me know what you think. Enlightening post! Maud’s art is unique, quirky. Hi Norman Nice pictures. Love that you got to see the house from the movie. What a fascinating shack that is! I’ve not heard of Maude but I can see that she liked color and used what she had at hand to make her life better. Interesting door, for sure. Welcome back, Norm. I hope you’re refreshed and renewed from the break. What a sad story about the abject poverty, but what a joyous statement her paintings in the “house” make! I’m happy about the move and preservation, too. Thanks for sharing this. It seems lots of artists, even those known worldwide often struggled during their lifetimes. Thank you Janet.Yes the break did me good. It happens so often with artists that only after they’re gone do others truly see the value of their work. 🙂 At least you didn’t have to die to get recognition. Nice to have you back. You brought a wonderfully different setting for a door! Well, you certainly got me here. I was unaware of Maudie, the artist or movie, I am ashamed to say. But I will be on a mission to find out more. 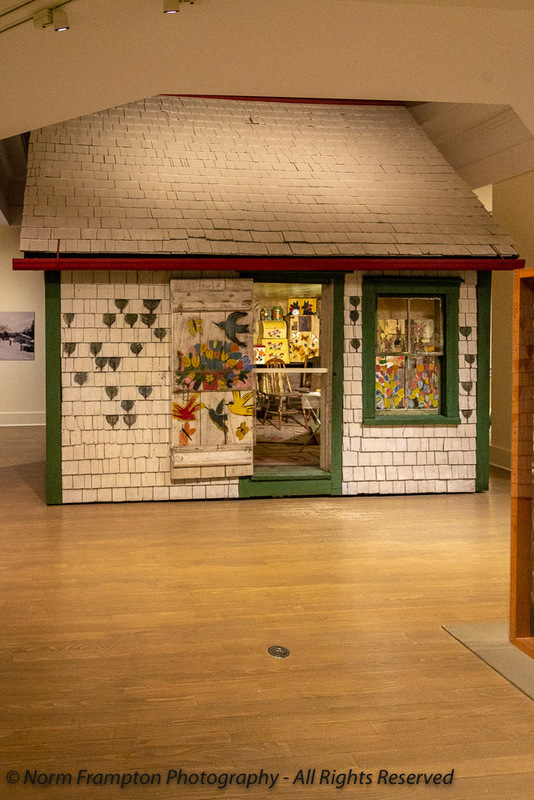 The house as an exhibit, is absolutely fantastic and makes me want to go to Halifax just to see it. I was only vaguely familiar with her work before seeing the movie a few months ago. After that I knew that we had to take some time to check out this exhibit since we were going to be in the Halifax area on vacation. People say that a bit of paint can go a long way in brightening up a place, and in this case it went a really long way! It’s heart-warming to see what she did with so little. P.S. hope you had a good break! Heartwarming indeed. Thank you so much. If you do end up watching the movie, please circle back let me know what you think of it. Thanks Judy. I’m glad you got to see the film and even more that you enjoyed it. Welcome back, Norm. It’s good to see your post in my inbox! What an amazing story. The little you were able to share makes me sad and happy. I am glad the house was preserved, so that her amazing work isn’t lost. That front door is so fun looking, it’s hard to imagine that they were living in poverty. Thank you Dan. It was a delight to see this place in-person knowing it was now protected from the elements. You should have seen the display with photos and info panels explaining how they dismantled, moved, restored, and reassembled it all. Fascinating stuff. How marvelous. The art itself shows her joy of life and creating. Thanks for sharing her story, Norm.